1384 N Barlow Lane is located on the North end of Bishop. This highly desired neighborhood is just outside the city limits, and you will often see your neighbors out walking with their families and pets. This 3 bedroom 3.5 bathroom home offers a spacious floor plan with the living room, kitchen, formal dining area, and half bath on the main floor. The kitchen offers granite countertops and views of the Sierra Nevada Mountains through the window and sliding glass door that leads you to the back yard. The living room offers a propane fireplace and built in mantle to keep you warm on those cold winter nights. The second level offers the master bedroom and guest bedrooms, each with their own private baths. Tiled entry, kitchen and bathrooms, carpet in the living and dining area, stairway and bedrooms. This home offers a fully landscaped low maintenance yard with automatic sprinklers. Exiting through the back sliding glass door you enter the fully fenced back yard. This home is walking distance to open DWP land with walking, running or bike paths. 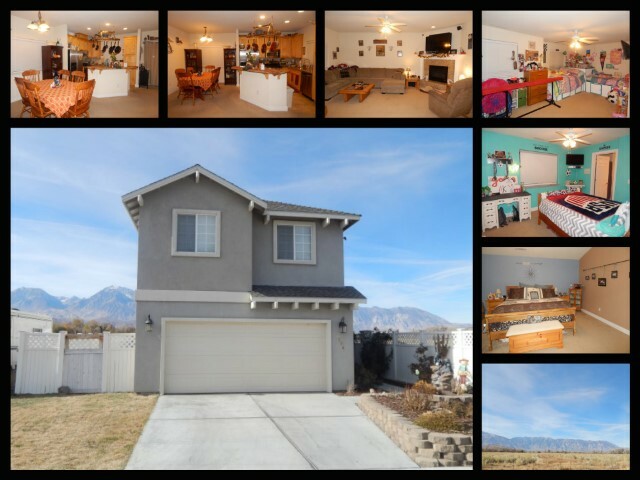 This home is located just outside the Meadowcreek neighborhood is a sought after area on the north edge of Bishop. There are great walking trails surrounding this neighborhood and the Rite-Aid shopping center is nearby offering shopping and restaurants. Bishop is a great place for hiking and fishing, and other great outdoor activities if you please.